RasAyana [Rus aayana] is a sankrit word with literal meaning: Path (ayana) of the Juice (rasa), or Elixir) as per Wiki. In colloquial kannada however, RasAyana simply implies a fruit salad in general or one mainly made of bananas. The RasAyana that I talk about here is a simple yet delectable dish made of bananas, which is typically a must on special occasions like festivals, birthdays, weddings and the like in traditional Iyengar settings and served among the first few items on a festive platter. Besides being tasty, I particularly love how it works well as a super quick dessert to entertain unexpected guests in a jiffy. 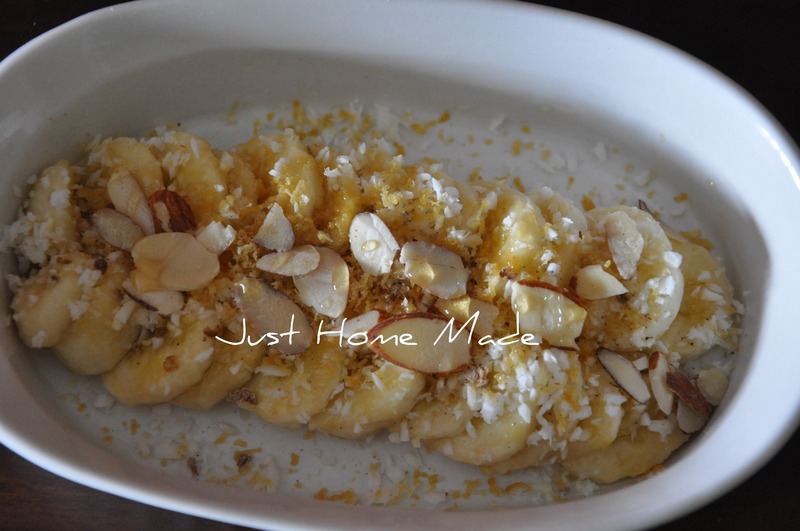 In the picture is a de-constructed banana fruit salad and slivered almonds are my addition to the traditional recipe. The combination of jaggery and coconut along with the mild aroma of cardamom elevates the sweet taste of banana to another level. Combine all the ingredients and garnish with slivered almonds. Love it. I am going to eat it soon. Love the simplicity of it.